Fidelity Investment provides variety of sector equity mutual fund. 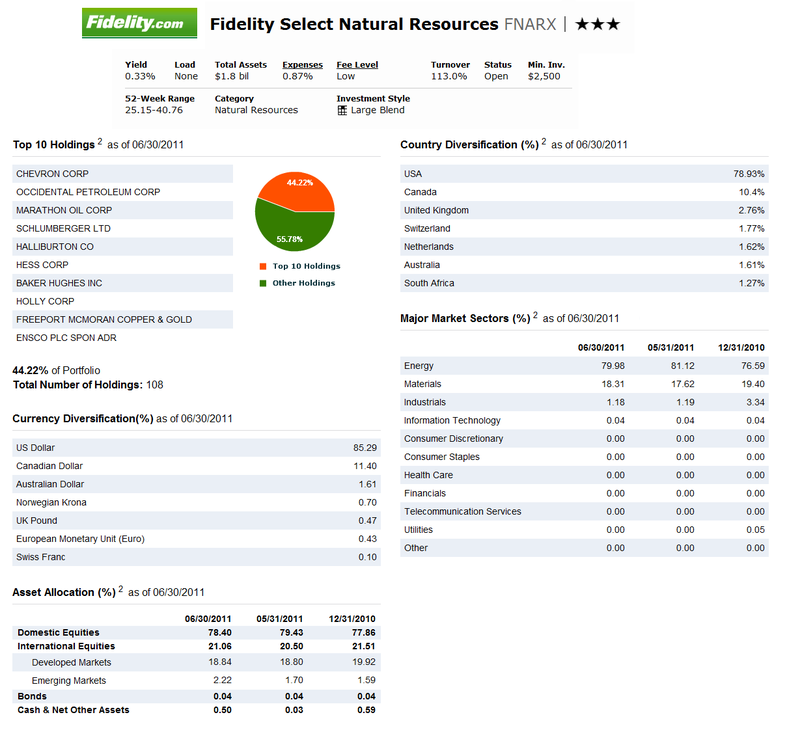 One of the best sector funds is Fidelity Select Natural Resources. The following article will provide fund's review of this Fidelity sector fund including yield, rank in category, fund's manager, etc. The Fidelity Select Natural Resources fund objective is to seek capital appreciation. The fund generally invests >80% of assets in securities of companies principally engaged in owning or developing natural resources, or supplying goods and services to such companies, and in precious metals. Natural resources include precious metals, ferrous and nonferrous metals, strategic metals, hydrocarbons, chemicals, paper and forest products, real estate, food, textile and tobacco products, and other basic commodities. It may invest in securities of foreign issuers. The fund is a non-diversified fund. The fund’s expense ratio is 0.87% per year. It also has a yield of 0.33%. The fund has been managed by John Dowd since 2006. 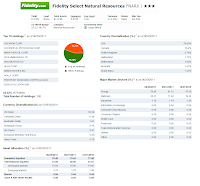 As mentioned, this Fidelity Select fund is classified as natural resources sector mutual fund. The fund has total net assets of $1.82 billion. Currently this best rated sector equity fund is on the 1st rank in the Natural Resources Category. This natural resources fund has its best performance year in 2009 with 51.74%. Its worst performance return occurred in 2008 with -52.39%. Investor will need $2,500 minimum balance for the regular brokerage account and only $500 for retirement account (IRA) investment for investing in this Fidelity Sector fund. This sector equity fund is available to many investors. Investors can purchase this fund through 66 brokerages, such as JP Morgan, Schwab Retail, Ameriprise Brokerage, Vanguard, T Rowe Price, Fidelity Retail Funds Network, TIAA-CREF Brokerage Services, etc. The top major sectors of this FNARX fund as of June 2011 are Energy (79.98%), Materials (18.31%), Industrials (1.18%) and Information Technology (0.04%). The top 10 holdings out of 108 total holdings are Chevron Corp, Occidental Petroleum Corp, Marathon Oil Corp, Schlumberger Ltd, Halliburton Co, Hess Corp, Baker Hughes Inc, Holly Corp, Freeport Mcmoran Copper & Gold and Ensco Plc Spon Adr. The country diversification of this fund as of June 2011 is USA, Canada, United Kingdom, Switzerland, Netherlands, Australia and South Africa. According to the fund’s prospectus, the Principal Investment Risks are stock market volatility, energy industry concentration, foreign exposure, and issuer specific changes.